Let me put aside KPDX (sort of) for a second and talk about something that’s on my mind. I’m talking about a phenomenon called the False Consensus Effect. I’ve had a couple of emails since KPDX launched (literally, two emails), both of which were pretty aggressive in tone, and informed me that I was losing out big time by making scenery only for P3Dv4. And no, these weren’t X-Plane lovers, although I’ve heard from them as well. These rants were courtesy of the ranks of FSX pilots, and went something along the lines of “the vast majority of flight sim users still fly the 32-bit sims. Why would you want to miss out on all those sales by only developing for P3Dv4?” Why, indeed. I’ll address that question directly just this once: without sugarcoating it, these people are simply wrong. They’re assuming that because they still have an investment in FSX and don’t want to upgrade, “most” people are like them, ergo I’m somehow willfully depriving myself of large numbers of sales for some unknown reason. What they don’t have access to are the actual raw numbers that I saw before making the decision, numbers that are taken directly from years of sales trends to hundreds of thousands of add-on customers. Those stats paint a picture of the 64-bit sims (P3Dv4 and XP11) very much in their ascendancy. They have basically left the 32-bit platforms in the dust. Knowing that, coupled with the knowledge of how much effort it would take to downgrade the scenery without too much loss of visual fidelity, I had to make a choice: was it worth it to spend a few extra weeks on a port to FSX and P3D v1-3 for a single-digit percentage of extra sales? In the end, the numbers just couldn’t support it. Folks, this ain’t no anti-FSX tirade. I loved that sim, flew it for years, and devoted countless hours to building add-ons for it. If people want to stick with it and forgo the advantages of 64-bit, I say have at it and enjoy what you’ve got! But please, do so with the understanding that time has marched on and taken a great many developers with it. And if you decide some day to go whole-hog 64-bit, we’ll be there with some really cool add-ons, and maybe a tray of cookies. Last year, we released our first scenery – a little island getaway off the coast of Maine for pilots with the brass cojones to land there. It was a big hit, but some ‘simmers who ran third-party terrain mesh had some issues with it. We knocked around with some changes to the mesh that were intended to fix the problem, but it seemed like each time we fixed one problem, two sprung up to take its place. A couple months back, we hit a crossroads – continue trying to patch up all the little problems with time-consuming solutions, or try a completely different approach. In the end, we decided to drop back and punt. The other big change is that this version no longer relies on the Viva module for seasonal texture changes. In its place, we’re calling on the SimObject Display Engine, or SODE. The idea is to convert Nantucket to SODE at some point as well, and use it as our go-to dynamic content module going forward. It’s mature, it’s stable, and its capabilities make it a sure-fire winner. We think this will be a very positive development for our projects. 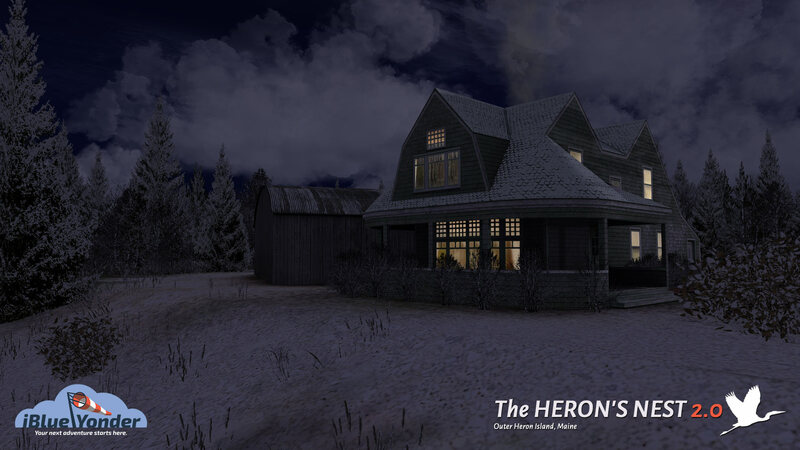 The Heron’s Nest still has a couple of minor tweaks and beta testing to go through, but it’s pretty close to the testing point as of now. We’ll keep you up to date as it nears completion. If you are reading this, congratulations, you made it through 2015! It’s a new year, and we’ve got some good stuff on track here at iBY. 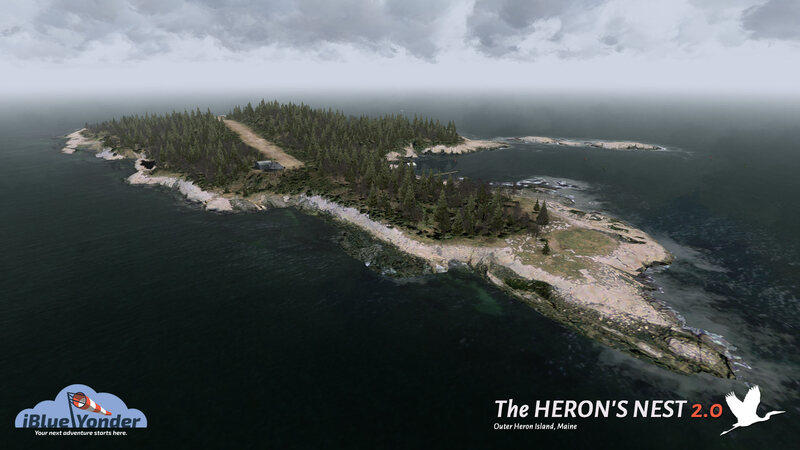 First up will be our Heron’s Nest scenery, your own private island off the coast of Maine. We’re in the final stages of beta testing right now, and expect a release in the next few days. All you’ll need to do to get it is sign up for our mailing list using the box to the right of this post. If you’re already on the list, expect a download link really soon. If you haven’t signed up yet, make that your New Year’s resolution! We hope you have a good new year, wherever your adventures take you! Your Own Private Island – Free! At the recent FlightSimCon, we announced the upcoming release of iBlueYonder’s first branded scenery package. Fans of our Cushman Meadows/Bear Gulch scenery (done a while back for Orbx) know that from time to time, we like to play around with “what-if” scenarios for private bush airports. 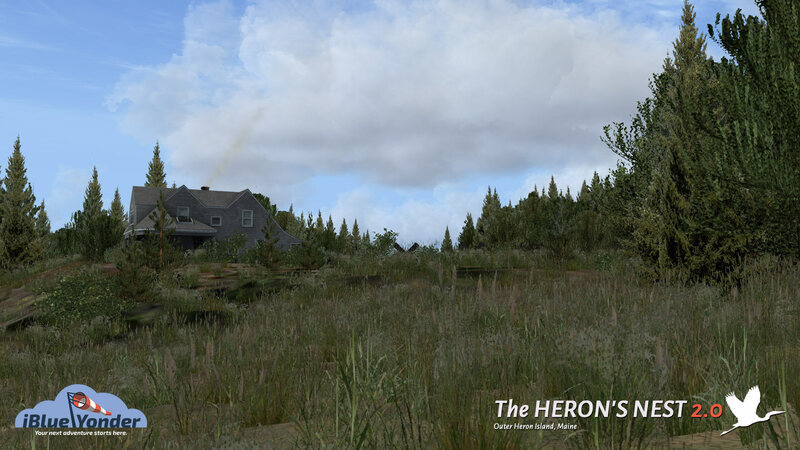 Since our geographic focus has shifted to the New England region of the US, we thought why not do a little virtual homesteading on one of the rocky, windswept islands off the coast of Maine? 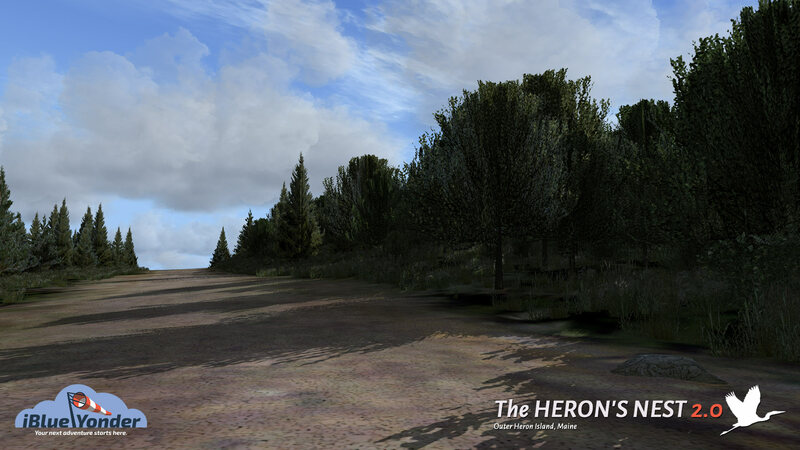 Introducing The Heron’s Nest, a rough dirt strip gouged into the crest of Outer Heron Island, Maine. It comes complete with a cozy little cottage, a barn hangar for parking your ride, and nature, nature, nature. If the undulating dirt strip gives you the willies, you can also fly in on floats and park in the water hangar in the protected cove near the cottage. How soon will this be ready for release? We’re aiming for mid-July. The original plan was to release it at the FS Conference, but we ran into a glitch that held up testing. If the FS gods are willing, the beta test will resume in earnest in a few days. How do you get it? That one’s easy; just sign up for our mailing list using the form on the sidebar to the right of this page. If you’re already on the list, then you’re golden: all members of the iBY mailing list will receive a link to download The Heron’s Nest free of charge. It’s our way of saying thanks for sticking with us through the rocky process of creating an all-new company. Tell your GA-loving friends, too. Once the scenery has been released, anyone signing up for the list will automatically be sent a download link. Now, back to the testing center! Friend. It’s almost a throw-away term any more. In our digital culture, nearly anyone we ever encounter, however casually, gets tagged with “friend”. Almost daily, writers and reporters decry the end of “true” friendships, the face-to-face kind rumored to have been sacrificed on the altar of social media and our disposable culture. What’s not mentioned as often are the real and lasting connections that the web allows – even between people who have never actually looked into one another’s eyes. Jon Patch was a friend of mine in that sense. We never met in so-called real life. We never shared a coffee or took in a movie. Thinking back, I’m not even sure I ever heard his voice. Yet for all that seeming disconnect, I came to have a good sense of who he was. The things I’ll remember about him are his kindness, how unflappable he was, how dedicated to his craft. He sang, he wrote poetry, and he spent countless hours of his time crafting beautiful flight sim renditions of the scenery that surrounded him. Americans like to joke about how pathologically nice Canadians are, and Jon certainly did his part to perpetuate the stereotype. In a hobby where it sometimes seems blowhards and man-children rule, he was the adult in the room, a steady, calming influence. Even when he got angry, it was hard to tell unless you listened very carefully. This evening, I got the news of Jon’s passing. I didn’t realize he’d been ill, but wasn’t surprised that he hadn’t mentioned it. That was just the kind of guy he was. What I do know is this: the sim world has lost a true gem, and though we had never been in a room together, I can’t help feeling I’ve lost a good friend. Blue skies, Jon. Thanks for hanging out with us for as long as you did. We’re all the better for it. The modeling of the north side of the field is nearly complete! I’ve been dialing in a group of buildings, including the checkerboard “Nantucket” hangar. Next stop: the main terminal.